11th Hussars: a rare QSA? Whenever I read the words "rare QSA", I ask "How do they know? "; "they" usually being a dealer. I may be too cynical, but there is much about the QSA for which is there is no hard evidence, no facts and figures upon which to judge such a statement. Most dealers never cite a source for what is an inducement to the buyer to purchase the medal now, "fools rush in......."
As I create The Register of the Anglo-Boer War I am building up the data upon which we can answer with a great degree of certainty that a QSA is truly rare based upon a host of factors; unit, sub-unit, clasps, rank and if you want surname, place of origin, casualty details; anything you fancy really. This article was prompted by the offer for purchase of the QSA group to Pte 4208 AE Eltringham 11th Hussars, described as a "rare QSA" and "QSA possibly unique to regiment with this clasp combination.". No sources cited, most dealers are experienced so they may be correct, but it could be Dealer X just hasn't seen as many QSAs to the 11th Hussars as another dealer. The only way to certify such statements is to look at the facts. 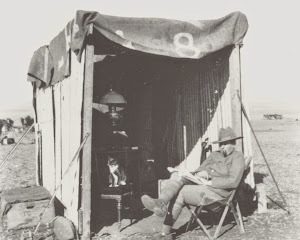 Published information states between 108 (National Army Museum and British Empire), 110 (angloboerwar.com), 114 (North East Medals) and 315 (DNW) men served in the war. The 11th Hussars did not serve in the war as a unit, they were stationed in Egypt, therefore it is likely not many men served and those that did would be attached to other units. Most of these sources quoted are just looking at the medal roll for the 11th Hussars itself, the detachment sent to Natal that became besieged in Ladysmith. The medal rolls show five officers and 99 men (104 in total) served in the Defence of Ladysmith attached to a variety of units; 5th Lancers, 5th Dragoon Guards, 18th Hussars, 19th Hussars and Army Veterinary Department. What most ignore that DNW alludes to with its figure of 315 is that many more 11th Hussars serving in South Africa are found on other unit rolls. How many men of the 11th Hussars served in South Africa? The Register shows 304 (18 officers and 286 men), about 40% of a typical cavalry regiment, which is a large number for a unit that did not go overseas. However, not all of these men were serving with the regiment in Egypt in 1899. An analysis of the service numbers and enlistments dates shows that 178 men had served between 5 years and 11 years 11 months; these men had served the minimum term of five years and were eligible to go on the reserve. Eleven men had served 12 years or more. Ninety-seven men had served 5 years or less, the majority of these (80) served in the Defence of Ladysmith. The contingent besieged in Ladysmith would have mostly come from the regiment in Egypt. Therefore the vast majority of the 11th Hussars who served were reservists called up in England and allotted to other units serving in at the front. Many served in both the 6th Dragoon Guards and the Remounts. The number of 11th Hussars that served in South Africa is three times greater than widely believed, but how many medals are named to the 11th Hussars, how rare is that QSA? When men served on attachment it is not always obvious which unit is on the QSA. Looking at medals on the market for the 11th Hussars it appears that "11th Hussars" is on all QSAs except for the men who served with the 6th Dragoon Guards and 19th Hussars (Defence of Ladysmith clasp). Pte 3239 CA Cook, 11th Hussar reservist, served with the 6th Dragoon Guards and the Remounts. His QSA and KSA are named to the "6th Dragoon Guards". However, a number of men are not on the 6th Dragoon Guards roll, but are marked as "attached 6th Dragoon Guards" on the Remounts roll. Their medals may be named 11th Hussars and not 6th Dragoon Guards like Cook's medals. Pte 4231 J Wood, 11th Hussar reservist, served with the 19th Hussars in the defence of Ladysmith. His QSA is named to the 19th Hussars and his KSA is named to the 11th Hussars. This straw poll would seem to indicate that the majority about 250 of QSAs issued to the 11th Hussars are named "11th Hussars". In the scheme of things 250 is a small number of QSAs, but not rare as such; frequency of 11th Hussars medals on the market is a different consideration, they do not appear often. What then of Pte Eltringham's clasp combination of "Johannesburg,Diamond Hill,CC,OFS", is that unique? Yes, it is and only two others have that combination with other clasps. This research has shown that significant numbers of men from cavalry regiments served with the Remounts. What needs to be established is how many of these men are not on the regimental rolls, and are "new" as such increasing the numbers served as we have seen for the 11th Hussars.